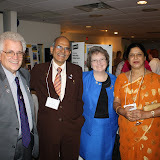 Freeport Rotary Hosts 2012 Rotary District 7780 Conference! The Rotary District 7780 annual Conference was held this year at the Harraseeket Inn in Freeport on May 18-20. The weather was perfect, the Harraseeket Inn was top notch, and as usual, there was an overwhelming amount of information regarding the excellent service work and international exchanges the clubs in our district achieve. District 7780 consists of 40 clubs in southern Maine, New Hampshire, and one club in northeastern Massachussettes. Several Freeport club members attended at various points throughout the conference. Activities kicked off on Friday morning, May 18th, with a painting of a giant multicolor U.S. map at the Morse St. elementary school in Freeport. Ten Freeport Interact Club members, leader Anne Marie Davee, and Freeport Rotarian Todd Doolan did most of the work, with the assistance of Past District Governor Brad Jett and his wife Penny. Governor Gary and wife Judy attended as well. The conference kicked into gear mid-day on Friday and went through to Sunday morning. It consisted of discussion panels, informational breakout sessions, a great silent auction, "Moose on the Loose" display boards from most clubs, great meals, entertainment from talented youth, and a lot more.